The Image Gently campaign is part of a growing effort to avoid unnecessary radiation exposure in children. A report released in March by the National Council on Radiation Protection & Measurements found that the amount of radiation to which Americans are exposed is growing rapidly. The report found that radiation exposure increased sixfold from 1980 to 2006 and that a large part of the increase is from medical imaging, particularly CT scans. The increase in exposure to ionizing radiation has been of growing concern in the medical community because it may result in long-term harm to patients, including the potential to increase the chances of developing cancer. The concern has been particularly keen for pediatric patients, who are at a higher risk due to their bodies’ greater sensitivity and a longer life span to manifest any changes. The pediatric radiology community has taken the issue to heart. 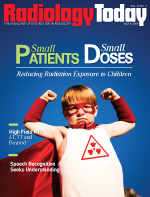 In January 2008, four societies, the Society for Pediatric Radiology, the American Society of Radiologic Technologists (ASRT), the ACR, and the American Association of Physicists in Medicine, launched the Image Gently campaign to raise awareness of the need to child-size radiation doses when performing medical scans. In its first year plus, the alliance has grown significantly, says Marilyn J. Goske, MD, of the Cincinnati Children’s Hospital Medical Center and chair of the Alliance for Radiation Safety in Pediatric Imaging, the organization that sponsors the Image Gently campaign. Another sign of the campaign’s success, Goske says, is that the National Quality Forum named Image Gently’s goal of reducing unnecessary exposure to ionizing radiation in pediatric patients as one of the 34 best practices for 2009. “We’re really pleased about this, as it will help promote the practice through a variety of other quality and safety organizations outside of radiology and help propel this issue to national attention within hospitals,” she says. The alliance also has expanded the target for its message beyond physicians, technologists, physicists, and the industry. In January, in conjunction with the American Academy of Pediatrics, it began distributing brochures for parents that alert them to the risks and benefits of using medical imaging modalities requiring ionizing radiation. The brochures, available online through the academy and the Image Gently Web site (www.imagegently.org), are free and meant to be downloaded for distribution in physicians’ offices. “Parents can read the information, which is presented in a balanced way, and then, if they still have questions, they can ask the appropriate medical professional at the time of their child’s scan,” Goske says. The campaign is also promoting the “My Child’s Medical Imaging Record” card, which parents can use to record any scans their children have undergone. The amount of what is called “technique” used at the time of a CT scan on a child varies with the manufacturer, the year the equipment was made, and a variety of technical factors. “You can’t assign a ‘standard estimated’ dose for children of widely variable size. Consider the difference in technique used for a 4-lb premature infant compared to the 200-lb football player,” Goske says. Radiology departments with a variety of pediatric scanning frequencies seem interested in the guidelines, Goske says. “The universal protocols have been downloaded thousands of times, and the worksheet that goes with them has too. We have some indicators that suggest strongly that people are making changes and really embracing this,” she says. Pediatric medical imagers say that child-sizing their CT settings are not the only steps they are taking to reduce exposure to ionizing radiation for their patients. Marguerite T. Parisi, MD, MSEd, a pediatric radiologist and the section head of PET/CT at Seattle Children’s Hospital, says it is standard protocol at her hospital to review requests for CT and determine a study’s appropriateness. “If alternative modalities that do not use ionizing radiation, like ultrasound or magnetic resonance, can provide the necessary information to answer the clinical question, then we will perform that procedure instead,” she says. The Image Gently campaign started with a focus on CT, but the effort to reduce children’s exposure to ionizing radiation recently has expanded to include conventional nuclear medicine studies, PET, and PET/CT. Last summer, S. Ted Treves, MD, chief of the division of nuclear medicine at Children’s Hospital Boston and a professor of radiology at Harvard Medical School, raised the question of lowering radiopharmaceutical dose for pediatric patients when he published a study in the Journal of Nuclear Medicine in June 2008. Treves says he was alerted to the lack of universally applied standards for administering radiopharmaceutical doses to children undergoing nuclear medicine examinations when he was asked to participate in a multicenter study using one radiopharmaceutical as an endpoint. “For us to comply with the multicenter study, the doses of radiopharmaceutical they were recommending were significantly higher than what we use in practice here,” he says. “So I started a conversation with the directors of the trial and suggested to them that we would like to participate but not at the expense of giving the children a much higher radiation dose, since our practice shows that a much lower radiation dose is as effective.” The researchers eventually allowed Treves to use the lower doses for the study. He then decided to survey the 16 top pediatric hospitals in the country and ask them what their protocols were. He found a great deal of variation in dose among the 13 children’s hospitals that responded to his survey. But Treves was not surprised by the finding, as the majority of radiopharmaceutical package inserts do not provide guidance on pediatric doses. When imaging children, he says, physicians typically base dosages on the patients’ body weight, the nature and type of the problem being investigated, the equipment being used, and their own experience. “This has led to the variations in dosage that currently exist,” he says. Members of the Pediatric Imaging Council and the Society for Pediatric Radiology who practice nuclear medicine are examining administered dosages and are planning to formulate recommended pharmaceutical dosages within the year. Treves says that new image-processing techniques that have emerged in the last few years should make it possible to provide diagnostic information while lowering administered radiopharmaceutical doses.